Walt Whitman is considered to best poet America has ever seen and is regarded as the father of free verse. His style is a close combination of transcendentalism, Indian philosophy, patriotism, love and realism. Leaves of Grass is the magnum opus of the bard with multiple revisions ever since its first publication in the year 1855. The title underwent several revisions throughout his life and has some immortal poems like Song of Myself, When Lilacs in the Dooryard Bloom’d, Out of the Cradle Endlessly Rocking, O Captain! My Captain! and many others. Whitman was a combination of many philosophies and in many ways supported the abolishment of slavery. Abraham Lincoln during that time waged a Civil War against the North to ensure black freedom. His efforts were successful but the President was assassinated shortly. This was the incident that disturbed Whitman who produced two of the most famous elegies in English literature – When Lilacs in the Dooryard Bloom’d and O Captain! My Captain! The latter was written in the year 1865, the same year Abraham Lincoln died. The poem is a straight elegy and does not create confusion about the inner meaning of the lines. The three stanzas reflect the mourning state of the speaker. The speaker starts with joyful shouts calling out his captain as he sees the port. He states that the trip is complete after an exhausting journey and they have emerged victorious. He hears the bells and people cheering for their triumph in the sea. The jubilant mood changes as the speaker finds the captain dead on the deck. The speaker cannot believe that his captain is dead. He pleads the captain to rise as there are lot of cheers and expectations for him on the shore. He describes the tolling of bells, flung flags on his honor, bugles playing, cheering of crowds with bouquets and wreaths in their hands. He implores the captain to look at the eager faces of the crowd as he keeps his hand beneath the head of his captain. The speaker feels that it is some sort of dream watching his captain dead on the deck. Captain is motionless; his lips turn pale and cannot feel the arm of the speaker. He observes that there is no pulse nor does the captain possess a will to live. As he mourns the death, the ship slowly reaches the port completing its voyage. He asks the bells to ring and the shores to exult on the victory the ship was able to achieve. However, the speaker is aware of the death of the Captain and says that he will mourn for his captain dead on the deck. Walt Whitman was a great supporter of the North and encouraged the cause through his works. He never met Abraham Lincoln and neither was he fond of the ways of the President (initially). As the war progressed Whitman started to like the ideals of Lincoln and he became very affectionate towards the man. As the Civil War gave results and slave freedom was achieved, John Wilkes Booth from the CSA (Confederate States Army) shot the President as an act of vengeance. This was a major shock to the nation that was already facing tumultuous circumstances due to the war. O Captain! My Captain! by Walt Whitman is a reflection of the mourning of the people as well as the poet for the death of Abraham Lincoln in 1865. O Captain! My Captain! was written in the year 1865 and later added to famous collection Leaves of Grass. Walt Whitman, who is known for his free verse, uses rhyme scheme for this extended metaphor. The rhyme scheme varies to each of the stanzas and the first stanza rhyme scheme is AABCDEFE. Throughout the poem Whitman never directly refers to Abraham Lincoln but is clearly evident from the subject matter that the poem is written in his memory. the joy. “Fearful trip” in the first line refers to the Civil War that has exhausted the whole nation which is expressed through the phrase – “weather’d every rack”. The people realize that the war is won and start to celebrate and it certainly was a nationwide festival. The ship or Southern states that supported the cause of Lincoln was approaching the shore victorious. It is at this time the speaker finds his Captain dead. It parallels to the exact time when the Confederate Army plots and assassinates Lincoln. A disorder is observed in the speaker as he is caught between the prize won and the disaster witnessed. The rhyme scheme for the second stanza is GGHIJEKE. Whitman never met Abraham Lincoln but their connection in certain aspects like patriotism, abolishment of slavery, progress, etc. were strong and identical. 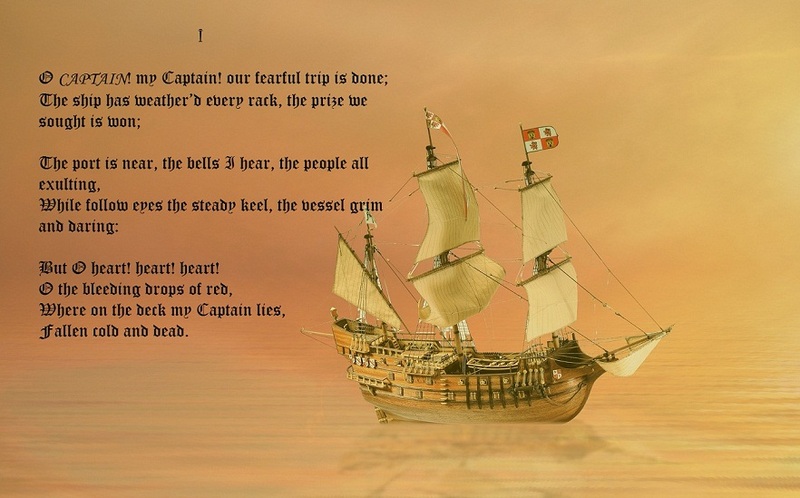 The strong transcendental association can be seen through the second stanza where the speaker expresses strong emotions after seeing the captain fall in the ship. 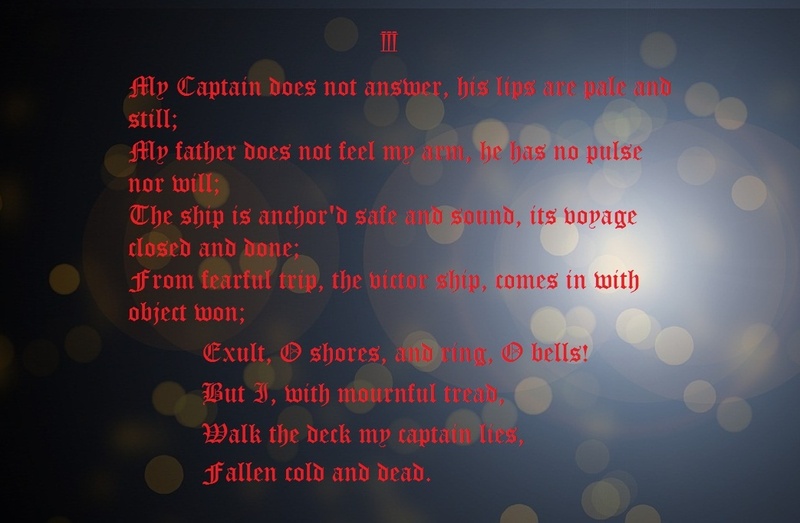 After throwing great impetus on the crowd and the preparations made on the shore to celebrate the victory, Whitman through the speaker wishes that the death of the Captain is a dream. Abraham Lincoln had a premonition about his death three days before the assassination. He saw a man on a catafalque in the White House and the guards on inquiry say that it is the President. The last two lines of the second stanza is a reminder of this premonition as well the grief expressed by Whitman. The rhyme scheme for the third stanza is LLMNOEPE. The first stanza is a conflict between joy and grief, the second is a conflict between reality and dream; while the third is a conflict between pride and agony. The speaker’s agony is seen when he observes the lips of captain becoming pale. He says that the captain does not have a will i.e. he has achieved a most admirable victory for his people and reached the peak of his life. It is explained in the next lines where he explains the safe return of the ship and the victory announced. Walt Whitman uses the word “father” to show his love and respect towards Abraham Lincoln. He claims to be the one who will mourn for the loss while the crowd will feel happy about the victory. There is a contrast shown between those who only care about the end and those who remember people who were the means to that end. O Captain! My Captain! is a simple elegy that explains a lot about the conflicts during the Civil War, the predicament of people, struggle of Abraham Lincoln, exultation after victory, Lincoln’s place in the heart of everyone and the way the assassination shocked the nation. Walt Whitman was able to capture everything in three brilliant stanzas that are so famous even now and will be popular use forever. ← Seneca: On The Shortness Of Life – Relevancy of his predictions today!